Embarking on a solo cruise can seem like a bold step, especially when everything from the cabins to the dance contests seem to be designed for two. However, cruises can be an amazing holiday option for travellers who are in the know, with plenty of opportunities to make new friends and have exciting new experiences. We’ve put together this guide to solo cruising, so you can make the most of going it alone on an indulgent cruise holiday. When you are considering a solo cruise, it’s helpful to think about what kind of holiday you want and base your choice of ship on that. Many ocean-faring cruise ships are very large, more of a floating mini-city than a ship, which can make it difficult to meet other people if you are travelling alone. These ships are perfect if your reason for cruising alone is to take some time for yourself and do your own thing. If you are hoping to make lots of new friends and see the same faces each day at dinner, then a smaller cruise ship might be better suited to you. As a solo cruiser, there’s nothing more frustrating than spending an evening with new-found friends, only to never see them again because they are swallowed up amidst the thousands of other passengers. If you want an intimate, social experience, then a smaller ship is often a better choice for the solo cruiser. One of the most prohibitive aspects of solo cruising is the single person supplement that many cruise lines add to a single person occupying a cabin that is usually made for two. To make up the lost revenue from another person not sharing your cabin, many cruise lines will charge solo cruisers an additional fee. Typically, this will be around 50% more than the cost per person if the cabin was shared, although it can sometimes be as much as 100% more. However, many lines offer reduced single supplements through online deals, off-season discounts, and other offers designed to attract single cruisers. Some cruise lines have even begun to offer ‘studio’ cabins, designed specifically with solo cruisers in mind. As well as being priced individually, on some lines these cabins also give you exclusive access to a shared lounge with other solo cruisers. Perfect if you’re looking to meet other likeminded lone travellers. If you’re happy to share your space and brave the risk of your roommate turning out to snore terribly, some cruise lines offer the opportunity for you to share a room with another solo cruiser. The cruise line will match you up with another cruiser who is travelling alone, allowing you to share the cost of the room. This can be a great option for solo cruisers who are on a tight budget, or those who want to meet new people and potentially make friends for life on their cruise. 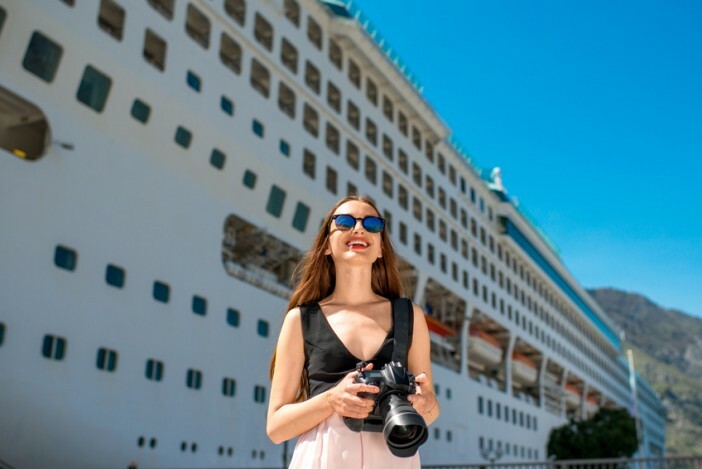 Some cruise lines offer meet and greets or special events aimed at those travelling alone, which can be a great way to connect with other solo cruisers on a big ship. Check the daily programme when you get on board and see if there are any events in the first few days for single cruisers. Even if the event itself isn’t very exciting, it can help you make a couple of friends to eat, grab a drink and explore ports with throughout your trip. Some cruise veterans also suggest heading to the piano bar on the first night to identify other solo cruisers who are looking to meet new people. One of the great things about cruises is how many group activities are on offer, from yoga classes to book clubs to ballroom dancing. As a solo cruiser, signing up to as many classes and activities as possible will help you find people with similar interests to you. The same goes for shore excursions, which can help you create cruise-long (or even life-long) friends. Whatever you’re doing, plenty of enthusiasm and a warm smile will work wonders when it comes to connecting with other people in the group. Dining can be one of the most nerve-wracking parts of cruising for the solo traveller, whether you most fear having to sit alone or having to make polite conversation with a table of strangers. If you do enjoy dining at a big table with lots of people, you’ll probably love the formal dining arrangement on most cruise ships, which seats big groups together. You’ll probably be sat with the same people every night, so this is a good way to make some friends. If you don’t get on with the people you are seated with at first, you can ask to move to a different group or request that you are sat with other single travellers. For those who like to dine alone, you are unlikely to be able to get a table for one in the main dining room, but the buffet is the perfect sanctuary for a quiet meal. Roll calls are discussion threads on cruise websites that allow people going on the same cruise to chat before they set off. They allow you to exchange information and get to know a few people before you set off, perfect if you’re travelling alone. Often, members of a roll call will arrange to meet up once you’re on the ship and sometimes go to an event or on an excursion together. Cruising alone can be a wonderful indulgence, allowing you to be selfish and do exactly what you want every day of your holiday. Whether you’ve always wanted a massage in the spa, quite fancy trying one of the speciality restaurants, or simply want to sit in the sun all day and read, use your cruise as a chance to indulge yourself. As a solo cruiser, you’re in charge of every minute of your day, so don’t forget to make the most of it! If you fancy booking a relaxing cruise break on your own, why not see if Cruise1st Australia have got an amazing deal to suit you? Browse the full collection online or call our friendly sales team on 1300 857 345.